Whether stationary or mobile, no commercial kitchen is complete without wire shelving. In addition to providing a home for the things your staff needs ready access to all day, commercial wire shelving serves as storage space as well as material handling and transport. Shelving manufacturers understand space constraints and offer an extensive selection of standard post heights, as well as shelf widths and lengths. myBoelter representatives are here to help you customize your shelving storage for convenience, mobility and safety. 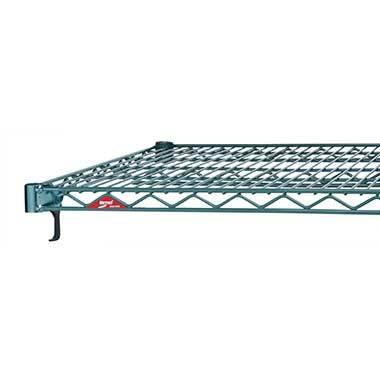 Metro A3060NC Super Adjustable Chrome Shelf - 60" x 30"
Metro A3048NC Super Adjustable Chrome Shelf - 48" x 30"
Metro A3036NC Super Adjustable Chrome Shelf - 36" x 30"
Metro A2460NK3 Super Adjustable Metroseal Wire Shelf - 60" x 24"
Metro A2448NK3 Super Adjustable Metroseal Wire Shelf - 48" x 24"
Metro A2448NC Super Adjustable Chrome Shelf - 48" x 24"
Metro A2436NK3 Super Adjustable Metroseal Wire Shelf - 36" x 24"
Metro A2436NC Super Adjustable Chrome Shelf - 36" x 24"
Metro A1848NK3 Super Adjustable Metroseal Wire Shelf - 48" x 18"
Metro A1848NC Super Adjustable Chrome Shelf - 48" x 18"
Metro A1836NK3 Super Adjustable Metroseal Wire Shelf - 36" x 18"
Metro A1836NC Super Adjustable Chrome Shelf - 36" x 18"
Metro A2460NC Super Adjustable Chrome Shelf - 60" x 24"
New Age 2583 Horizontal Brace - 48"
New Age 2535 Quick Change T-Bar Shelf - 24" x 60"
New Age 2533 Quick Change T-Bar Shelf - 24" x 48"
New Age 2523 Quick Change T-Bar Shelf - 18" x 48"
New Age 2513 H.D. Bar Shelf - 24" x 48"
New Age 2472TB Adjustable T-Bar Shelf - 24" x 72"
New Age 2460TB Adjustable T-Bar Shelf - 24" x 60"
New Age 2448TB Adjustable T-Bar Shelf - 24" x 48"
New Age 2448SB Solid Reinforced Shelf - 24" x 48"
New Age 2436SB Solid Reinforced Shelf - 24" x 36"
New Age 1836TB Adjustable T-Bar Shelf - 18" x 36"